View our Searching the Catalog How-To video! You can also limit your search by library. 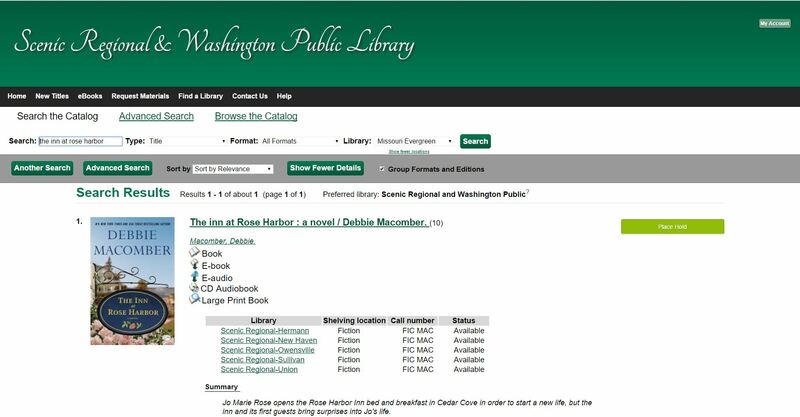 If you are using the catalog in a library, the default is to search the current branch. For multiple libraries, depending on how the libraries in your consortium relate to each, you may also search ranges of libraries, or select a specific library. 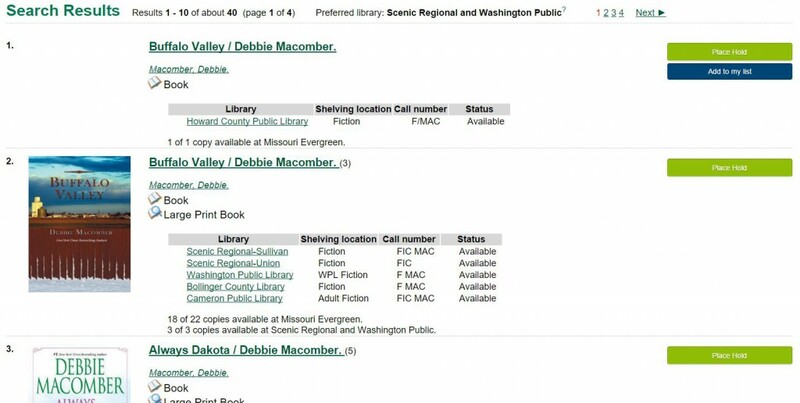 For example, with the Missouri Evergreen consortium, you have the options local library system, all Missouri Evergreen libraries, and choose specific libraries. If you are searching the catalog from home or another location outside the library, you may wish to choose your branch so that you can quickly see what’s available locally. These results show groups of related titles, which may include several editions and formats. For example, The Inn at Rose Harbor, is available in various editions, such as book, in large print, and as an audiobook. The item type is designated by the icon below the title and author for each entry. The number of available copies and total copies is displayed below the title on each record. Depending on whether you’ve selected a particular library, you may see the results for the branch, the consortium (all of Missouri Evergreen), and any intermediate groupings of your libraries. A title hold can be placed from the link to right of the record. This title can also be added to the individual patron list. Items can be placed on a list in the patron account. To place the item on a temporary list, click on the add to my list link. If you are logged in to your account you can place the item directly to the list of your choice in your account. Items on the temporary list can be moved to your list by logging in to your account. You can access information about your account from any page in the catalog by selecting the My Account link in upper right corner of any page in the catalog. Your account information includes contact information, items you have checked out or placed on hold, your fines, preferences for the catalog, and your lists, a place for you to keep reading lists or other lists of items. Each of the sections in the My Account area is described below. You should have been given a password when you received your library card. If this is your first time logging into your account, you will use your birthdate. Items Checked Out tab displays a list of all items that are currently checked out. The list includes the title/author of the item, the number of remaining renewals, the due date, the barcode, and the call number of the item. To renew any items, check the box on the far left side of each item you want to renew. Go to the dropdown menu just above the list and choose “Renew Selected Titles”. Then click “Go”. Your items will be renewed and a new due date will be shown in your account. The Holds tab shows the materials you currently have on hold (reserve). The title, author, format, pickup location, and status are displayed. You may cancel a hold, suspend a hold, or activate a hold from this screen. Clicking on the check box to the left of the item and then go to the dropdown menu above the item list and choose the action for the selected items. By clicking on the “edit” link to the right of the item, you can edit the pickup library, suspend a hold, activate a hold, and change the expiration date of the hold. In the Account Preferences tab personal information can be viewed. Patrons may edit their account name, password, and email address. Any other changes to personal information will be done by library staff at the patron request. Notification preferences may be set by each patron. The patron can choose to be notified by email, phone, or both. A default phone number for hold notification can also be entered here. Search preferences allows you to decide how many entries you want to see on a page when you complete a search. You can also choose your preferred search location and your preferred pick-up library for holds.